I love Edinburgh. Every season brings fresh colours and life to the city, it truly revels in each one. 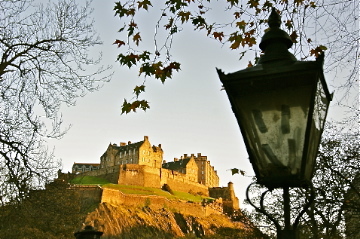 Here is autumn, sweeping across Princes Street Gardens setting trees alight with changing colours, blanketing pathways with leaves already shed, bathing the castle in light. I could walk for hours around here. Watching the sun set from Calton Hill gives a view of the sky and the city below, nights draw in harsh and cold and far too fast but but our compensation is the skyscape: as the sun fades, reds and oranges taken from the leaves below wash across the sky to make way for the moon, a trail of pink in their wake. I’ve been feeling very low lately and finding it difficult to find things worth my time, worth thinking about, worth doing, worth looking at, worth anything. So I’ve been walking a lot, trying to reconnect with the world and I feel nature is the place to start. That moment when beauty hits you; a tree of a hundred shades of red; a leaf dancing past your window; a crisp day with clear blue skies; a sunset that lights up the sky; I’m living for these moments right now, they’re addictive. The purity of their beauty and the perspective it can bring. 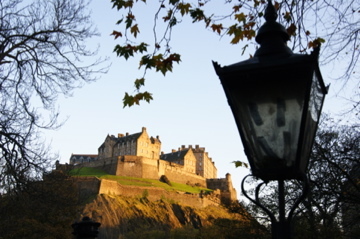 Of course, each to their own – you may detest the autumn, or maybe even Edinburgh (you crazy? ), but beauty can be found in anything and sometimes it can make all the difference in the world to give yourself a moment to stop and appreciate it. We’re always so busy and so caught up in our own minds it can be easy to miss out on what’s around us. If I were to ask anything of you I’d say: be still for a moment. Just stop worrying, stop rushing, stop passing these things by. Sit in a peaceful spot and watch how the wind passes through the trees, watch the birds weave through the air, watch a sunset from above the city. Stop and look at the world around us, watch nature, untainted, innocent. As a great man once said, ‘Go slowly with yourself’.